Are you prepared for a pet emergency? Just like humans, animals can experience several kinds of medical crises, like allergic reactions, bites, wounds, heat stroke and poisoning. The most important thing you can do in these types of situations is seek immediate veterinary care. 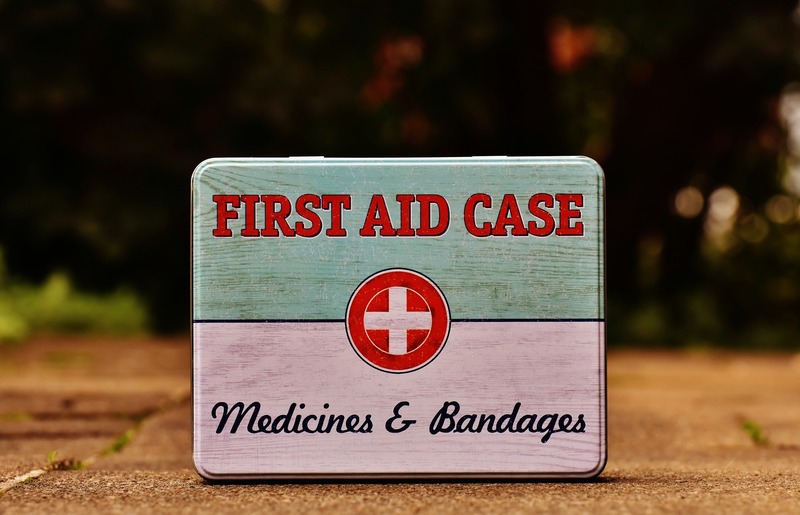 First aid measures should never replace professional medical attention; however, keeping emergency supplies in your home or car may help your pet in a critical situation before you can get to a vet. Phone numbers: Keep a list of emergency phone numbers, including those of your regular veterinarian, the nearest emergency veterinary hospital and a poison control hotline, such as the ASPCA Animal Poison Control Center, with you at all times. You may also program these numbers into your cell phone, but it is important to have a hard copy on hand as well. Records: Keep a copy of all your pet’s veterinary records in a waterproof container or bag. If your pet needs care at an emergency hospital, these records can provide immediate health information and save valuable time. A mobile app like Pet Notes can also help you keep all your pets’ information handy, but keep in mind that you’ll likely need a backup copy. A current photo of your pet can be helpful should he/she become lost. Slip leash: This type of leash tightens when you tug on it and prevents the pet from backing out of the collar. It is also the easiest to put on in an emergency. Muzzle: Any pet has the potential to bite, especially if he/she is scared or in pain. It is important to note, however, that muzzles should not be used if the pet is vomiting, choking, coughing or having difficulty breathing. Basket muzzles may allow for panting and drinking. Blankets and towels: Blankets and towels may be used to keep pets warm and comfortable, to restrain pets (wrapping smaller animals like a burrito can keep them calm and still for treatment) or even to transport an injured animal (blankets or towels draped under a larger pet’s abdomen can act as a sling). Pet carrier: A carrier or crate is always the safest way to transport a smaller animal, especially if he/she is sick or injured. However, a pillowcase or laundry basket can work just as well in an emergency. Water bowl: A collapsible bowl with a clip that can be attached to a backpack or belt loop can help prevent dehydration or heat stroke. Nail trimmers and styptic powder: These tools may be used for torn nails. Styptic powder is used to stop the bleeding of a pet’s quick when trimming nails and is typically available at any pet supply store. Cornstarch can also stop the bleeding of a torn nail. Tick Twister: This device safely and easily removes ticks without leaving the parasite’s mouth parts lodged in the skin. Booties: Pet footwear can prevent or protect injuries to the paw pads. In a pinch, a sock tied with medical tape can also keep injured paws clean and stop the pet from licking. Elizabethan collar (E-collar): Typically referred to as a “cone,” E-collars prevent pets from licking injuries, wounds or suture sites. These collars are usually tied with brown medical gauze, but may be tied with any type of string or rope in an emergency. Place two fingers between the gauze or string and the pet’s neck when tying to ensure it is not too tight. Gallon of water: Cool, clean water can be used to hydrate, rinse wounds, flush eyes and wet towels for overheated pets. Medical tape and vet wrap: Used to hold bandages in place and apply pressure to wounds, these items are also easy to tear without the use of scissors and will not stick to the pet’s fur. Gauze: A roll of gauze may be used to bandage a wound or can be applied to help reduce bleeding. Telfa pads: These pads are non-stick dressings for large wounds. They should be placed directly on the wound before applying gauze and securing with medical tape or vet wrap. Bandage scissors: These scissors have a blunt blade on one side to prevent laceration of the pet’s skin when removing a bandage or wrap. These scissors may also be used to cut through matted fur. Chlorhexidine wash or wipes: Chlorhexidine solution is a topical disinfectant that may be used to treat wounds and skin infections. Saline solution: Commonly used to clean contact lenses, saline solution can be used as an eye wash or to keep the eyeball moist if it becomes removed from the socket. Antibiotic ointment: Over-the-counter ointments, such as Neosporin, can be used for minor skin wounds. To keep the pet from ingesting the ointment, use an E-collar or bandage the wound after applying to prevent licking. Rectal thermometer: A pet’s temperature should always be taken rectally. It is important to note that a pet’s normal temperature is higher than that of a human. A rectal temperature between 100 degrees and 102.5 degrees is considered safe for both dogs and cats. Lubricating jelly: Petroleum jelly may be used to lubricate a rectal thermometer. Eyedropper: A large plastic eye dropper may be used as a syringe to flush wounds or give liquids by mouth. Hydrogen peroxide or salt: Either of these items can induce vomiting in an emergency, but should only be used when directed by a veterinarian. It is extremely important not to induce vomiting if the pet has ingested corrosive material such as strong acid, alkali or petroleum-based products. Benadryl: This over-the-counter medication can be used for allergic reactions in pets. Be sure to discuss the proper dosage for your pet with a veterinarian beforehand and label the correct dose on the bottle. Corn syrup: If your pet is diabetic, it is important to have corn syrup on hand should his/her blood sugar become too low. Syrup or honey may also be used. Please contact your veterinarian to confirm the correct dosage. Veterinary pain medication: Many pet owners mistakenly believe that human over-the-counter pain medications, such as aspirin, are acceptable for use in pets. In fact, these drugs can be very dangerous—even low doses can be toxic and potentially fatal. Instead, consult your veterinarian about a pain medication specifically formulated for pets that may be used on an as-needed basis. Other medications: It is important to include any medication your pet regularly uses in a first aid kit, especially if he/she has a serious medical condition, such as heart or kidney disease. We are located on the border of Montgomery and Berks County and service the Gilbertsville, Boyertown, Pottstown Pa, and surrounding areas.